Shhh! Don't tell anyone I'm about to get traded! With one week remaining until the non-waiver trade deadline, let’s take a look at some of the notable transactions that have been made thus far. The O’s picked up DH Jim Thome from the Phillies in exchange for C Gabriel Lino and RHP Kyle Simon. They also received SS Omar Quintanilla from the Mets for cash. These are two good moves for the Orioles. The still-dangerous Thome fortifies their lineup, and it’s a good move for the 41 year-old as well. Instead of biding his time on a National League bench, he gets to play more often with the AL club. Quintanilla is a solid defensive shortstop and can handle the bat pretty well too. The BoSox haven’t been all that active in July. They traded Justin Germano to the Cubs, then picked up pitching prospect Jose De La Torre from the Indians in exchange for Brent Lillibridge. The ChiSox picked up RHP Brett Myers from the Houston Astros. The Birmingham Barons traded RHP Matthew Heidenreich to the Corpus Christi Hooks and Winston-Salem Dash traded LHP Blair Walters to the Lancaster JetHawks. Basically, the Astros picked up 2 prospects for Myers from Chicago. Also, the White Sox are on the hook for just $1MM of the $4.45MM still owed to Myers this year, according to Dan Hayes of CSNChicago.com (via Twitter). It should be a good trade for each team – the ‘Stros pick up pieces for the future, and the Sox grab a bullpen arm for their stretch run. The Rockies traded RHP Jeremy Guthrie to the Royals for LHP Jonathan Sanchez. Colorado is so desperate for pitching right now that they’re willing to take a chance on Oliver Perez Lite. And one would imagine Guthrie (6.35 ERA with CO) must have popped some champagne upon learning he would return to sea level. At last, the Motor City Kitties appear ready to make a run at the AL Central. They availed themselves of the Marlins’ latest firesale by acquiring RHP Anibal Sanchez and 2B Omar Infante from Miami. In exchange, the Tigers traded RHP prospect Jacob Turner to Miami Marlins; the Toledo Mud Hens traded C Rob Brantly to New Orleans Zephyrs, and the Erie SeaWolves traded LHP Brian Flynn to Jacksonville Suns. They give up a top pitching prospect in Turner, but Sanchez, and especially Infante, will be a big help to Detroit down the stretch. The Astros have been big-time sellers this July, and rightly so for a team that’s 23.5 games out of first place in the NL Central. Thus far, they’ve dealt Carlos Lee, Brett Myers, Brandon Lyon, J.A. Happ, David Carpenter, and Wandy Rodriguez. In all, they’ve acquired 11 prospects in those trades, along with veteran outfielder Ben Francisco and veteran reliever Francisco Cordero. GM Jeff Lunhow did a great job building up their farm system. The Dodgers also lined up at the Marlins’ trough and partook of LHP Randy Choate and 3B Hanley Ramirez. They sent RHP Nathan Eovaldi and RHP Scott McGough to Miami. LA was desperate to bolster their lineup, and Ramirez (.752 OPS, 14 HRs) might be the guy to do it. A change of scenery would do him good as well. Despite the efforts of the Marlins’ PR department to paint a happy picture, Hanley was disgruntled in South Beach. The Dodgers gave up a promising right-hander in Nathan Eovaldi. And now to the Marlins. They started off July with a buy: Carlos Lee from the Astros. Since then, the team with the new stadium, new uniforms, but still no fans, have sunken to 12.5 games back of the NL East-leading Nationals. So it’s time to sell, sell, sell. Not that they haven’t gotten anything in return. Among the players they’ve received, Nathan Eovaldi is ready to help them now, and Jacob Turner should be ready to help them soon, though he will start off with Triple-A New Orleans. But this is not what the Marlins had in mind when they spent all their money on big-name free agents during the offseason. 2012 is turning into a disaster for Miami. The Mets were kicking the tires on some available relief pitchers, but then they lost 100 in a row or something, and now appear to be on the way to sellerdom. After all, the Mets’ only problems are no longer just bullpen and defense. Now you can add the starting rotation and lineup to that list. But their uniforms do look really good. So they’ve got that going for them. Which is nice. Remember fans, despite the Picard settlement, this is still a team deep in debt, with a system full of mediocre prospects (save for 2 or 3), and mediocre major leaguers . It’s this blogger’s opinion that Sandy and the Nerd Herd have to concentrate on rebuilding this organization from the draft up. The first-place Yankees made perhaps one of the most surreal trades you’ll ever see: They traded for Mariners’ OF Ichiro Suzuki while they were in Seattle. Ichiro walked across to the visitor’s clubhouse, put on a #31 road-gray Yankee uniform, and took the field for New York. How many Mariners fans showed up that night confused to see Ichiro’s name in New York’s lineup? Ichiro has not been himself the past couple of years. He had only a .642 OPS this year for the Mariners. But playing in the bandbox in the Bronx, and being surrounded by a potent lineup might provide just enough spark to make him a valuable piece for the Yanks. The Yankees gave up a couple of prospects (because they have the prospects to give up), gambling that Ichiro will show a flash of his old self here and there during the pennant run. But he is not at all the player he once was. They also picked up reliever Chad Qualls from the Phillies for cash. The Phillies’ biggest move this July did not occur in the form of a trade, but rather in the form of a huge contract extension. Philadelphia inked LHP Cole Hamels to a 6-year $144 million contract extension last night. So he’ll be around to bug the Mets (and the rest of the NL) for several more years to come. I’m not sure he’s worth that amount of money, but that’s what the market is these days. He’s still only 28 years old, so a 6-year extension isn’t all that outlandish. Overall, it’s a good signing for the Phils. The Buccos nabbed LHP Wandy Rodriguez from the Astros for LHP Colton Cain, CF Robbie Grossmanand LHP Rudy Owens. Besides being a Mets killer, Rodriguez is a solid starting pitcher who should help keep the Pirates in contention the rest of the way. It’s refreshing to see Pittsburgh, a storied National League franchise, back in the hunt for a pennant. Canada’s Team is only 4 games back of the AL Wildcard, despite being in last place in the AL East. They added RHP Brandon Lyon, LHP J.A. Happ and RHP David Carpenter from the Astros in return for RHP Francisco Cordero and LF Ben Francisco and a slew of prospects. The Jays are going for it, and they should. Opportunities to get to the playoffs have been few and far between for this franchise. So, with 6 days remaining until the non-waiver trade deadline, the big moves are starting to pile up. What other blockbusters do we have in our future? Will the Mets get involved? As is the case every year, it will be fun to speculate. I don’t understand why the Mets aren’t in full sell mode. There should be buyers for Murphy and Hairston, neither of whom will be that big a part of the Mets’ future but both of whom could help a contender right now. Time to stock up the farm system. Other than Wright and Tejada I think no one should be untouchable. Now, no one wants to talk about shopping Dickey, but I think we should. He’s having a career year, which is bein wasted on these Mets. At 37, even as a knuckleballer he can’t have too many more seasons like this one left in him. What team in contention wouldn’t kill to add him to their rotation? Seems to me that selling Dickey alone would significantly upgrade the entire Mets farm system, which would help the big leage team for many more years than Dickey could possibly keep playing. Come on Paul…. You lose all credibility when yoiu tell us Quintenella is going to get a l,ot of playing time in Baltimore at SS. So you are telling us he’s better than JJU Hardy and going to take Hardy’s playing time away? They took him because all their second basemen are hurt and he’s going to play there until they get one back. I actually meant Thome would get more playing time. Actually he said he would get more playing time, which is true compared to the playing time he got with the Mets. Relax guy…. I’m with Andy, we should get whatever we can for Hairston and any relievers other teams want. I’m not sold on Valdespin as our future 2B, but maybe moving Murph is worth the gamble if we can get prospects back. As for Dickey, I expect his arm and fingers have plenty more years of knuckleballing left. 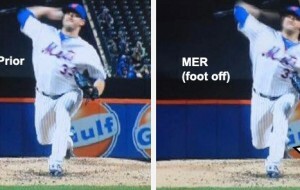 Whether his legs and the rest of his body hold up enough to keep throwing it so hard, I don’t know. Maybe another couple very good years, and then a few average ones? I’d only do it if we got a LOT back. And that seems less likely than it did a month ago.